This was the first time I had visited Bradley's lake. I'd heard it was a big water, but well over 100 acres, it was still a shock and made me wander if I'd chosen the right place! I mean locating the fish is one of the most important factors in carp fishing, right? But where do you start with 100 acres!! However, the size of the lake was not the only surprise, the lake was also empty! Wow, for years I'd fished places like Linear in Oxfordshire, and the RMC waters and got used to putting up with less choice for swims, now I had 112 acres to myself - Yahoo! In the end I settled for a peg on the bank next to wood pool. This was where a strong South-west wind was blowing to. I liked this peg because it also had a buoy not too far out in front and I wanted to use that as a rough marker guide in order to bring some perspective to that huge water mass in front of me. I also thought that I could fish the little "wood pool" next to Bradley's if there was no action on the big lake, although, I later found I wasn't allowed to fish it. 5pm: I was finally set up at around 5pm. It took me much longer because I and needed to use the marker rod much more before even thinking about rigs and end tackle. I had found a clear, hard patch out over a weed bed at around 75 yards. After spodding out over ten kilos of bait within a few hours, I felt it would give the area enough bait to keep the carp coming back over the next 3 days. 8pm: I had a few line bites on the middle rod which was on the baited area. I decided to bring in the lines a little closer in and try another clear patch I had found with the marker earlier in the day. No takes for 3 hours. 11pm: I had changed all 3 rigs, making one with a longer hook link, one changed to clear nylon material and using a bigger hook size. The third rig was changed to all braid and placed in a PVA bag to wallop out to an area I thought was some fish movement. Although, at this time it was hard to hear any fish because the wind was picking up and the water was getting much more choppy. 1am: By the late night / early morning times it was much more windy and I think this was the wrong time of week to come fishing, however, I must persevere and try to get the best out of a bad situation. No action all night! 8am: The second day was a complete nightmare! The winds started picking up heavily towards the latter hours of day one, and got progressively worse through to the early hours of the morning. By the time I had got up the water was so choppy that waves were lapping right up onto the bank. The undercurrent was pushing so hard that clumps of long weeds were driven down the lake and catching up on my fishing lines which then dragged the rigs partly along the bottom causing the hook to catch debris. It was almost impossible to present a bait at any distance over 40 yards. I had never experienced this kind of extreme winds and currents. 2pm: All 3 rods was out of the water by 2pm. I had decided to wait for the winds to die down. In the meantime I used method mix and regularly catapulted in heavy method balls of bait. This was so the heavy bait would drop straight to the bottom and the weight would make it stay there for several hours. If I was going to wait out the storms I wanted to get plenty of bait settled in the swim for when the rods would go back in. Some may believe this could over-bait the swim, and I would have probably been better fishing for single bites. However, I was aware that there are thousands of carp in Bradley's lake and these stockies alone could wipe out 20 kilos of bait in no time! 8pm: The stormy strong winds kept up all through the night. My only hope was for a good last day of my first fishing session at Bradley's lake. 6am: The stormy winds had finally calmed right down by the early hours of the morning. I finally had chance to get the rods out onto the area I had been baiting for a day. I placed a balanced boilie on the hook and cast it out. As the other rigs were being prepared for casting, I had a ultra fast take as the rod bounced up and down on the pod. I pulled into an erratic fish as it tried to escape the swim. 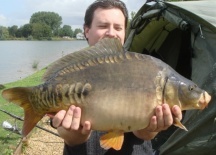 Within ten minutes I had caught my first Bradley's mirror carp. It only weighed about 6 pounds but I was glad to catch after the long wait through the storm. 6.30am: The rod went off again within 20 minutes of casting back into the area. This was another carp but it was very jerky during the initial stages of the fight, this I believed was another stockie carp. Yes, it weighed just over ten pounds. They are getting bigger! 7am: Another stockie of about 8 pounds hits the net within ten minutes of casting. My tactic was working, these fish had stayed around to finish off the baited patch. After another 3 small carp of up to 9 pounds in weight, I started to believe that the fish was here for the day, and that maybe a big thirty would come along any minute. 8am: It was getting crazy now, it seemed like a run every cast! Although all of them was only small stockies with the biggest 11.8, it was nice to actually have numerous runs just like in the old days when I first started carp fishing. 11am: The fishing session was due to end soon, but I knew I would be packing all the gear into the car and leaving the rods in the water right until the last few minutes. Yes, and I was still getting runs on packing up the rods! Yes, I had thoroughly enjoyed my first trip to Bradley's lake. I had only caught the small fish in the lake but it was a nice way to end. I would definitely be visiting Bradley's again in the near future.